The main salmon farmer in Scottish waters has reported a sharp fall in the tonnage produced last year, much of that due to the problems with sea lice. Mowi's annual report reveals the amount of gutted salmon it produced from Scottish waters fell by 36%. In 2017, the total weight of gutted salmon from Scotland was 60,186 tonnes but last year it was 38,444. According to Mowi, the total supply of salmon from all the country's farms was 138,200 tonnes, down 13.4%. Profitability was helped, however, by increased scarcity feeding through to higher prices. Norway-based Mowi, which recently rebranded from Marine Harvest, said the lower tonnage was due to lower stocking of smolts, or young salmon. This in turn was due to "biological issues", which can mean sea lice infestations or disease. Salmon farming companies have been investing in research and development of methods to reduce the problem of sea lice. One of these is to leave salmon cages empty for longer periods between stocking. Mowi's annual report said the incidents which raised fish mortality during last year included anaemia, fish damaged in a storm, "gill issues" and deaths at a newly-opened hatchery. It added: "By the end of 2018, Scotland reported an improving trend in fish survival and good control of sea lice prevalence." The Scottish figures contrasted with two countries that produce a much larger share of the 2.2m tonnes of Atlantic salmon produced by salmon farms last year, up by 5.4%. Total Chilean output was up 102,000 tonnes of gutted fish, to more than 600,000, after being affected by an algal bloom in 2016. That helped supply fast-growing markets in the US and Brazil. Norway remains by far the biggest producer, up last year by nearly 4% to 1.128m tonnes. After being banned from the Chinese market, Norwegian salmon has now been allowed back in, and salmon imports were up 18% last year. The Mowi report highlighted concerns the company has about its use of small cleaner fish, such as wrasse. These are used to eat sea lice off the skin of salmon in the farm cages. Within the risks foreseen by the Norwegian firm is the possibility that its catching of cleaner fish will harm wild stocks, and could lead to regulatory action to limit its activities. Last year Marine Harvest announced major spending cuts in response to the rising costs of treating sea lice and disease. Don Stanford, a campaigner against the activities of the salmon farming industry, alleged that the fall in Mowi's Scottish output was not about lower stocking levels, as claimed, but due to its farming practices. 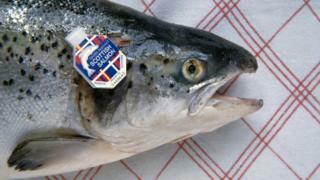 He said: "Disease-ridden Scottish salmon farming is dead in the water. "Salmon farms are plagued with problems leading to a drastic fall in production in 2018."